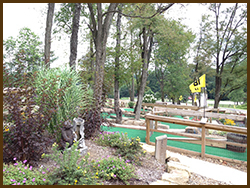 100 sites with full or partial hookups, picnic tables, fire rings, clean showers and restrooms, playground, new swimming pool, hiking, 5 acre fishing lake (catch ‘n release), paddleboats, horseback riding, hayrides, new 18 hole miniature golf, Kamp K9 Pet Playground and game room, laundry, grocery store, gift shop. All full hookup sites have Cable TV. 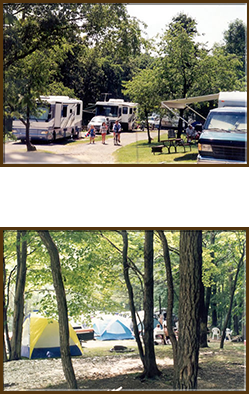 There is Wi-Fi throughout the campground. 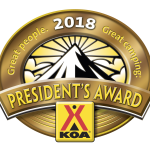 10% Discount for KOA Value Kard Rewards! 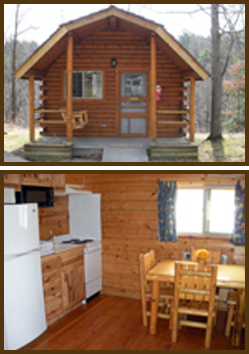 Cozy log cabins are heated and air-conditioned, have wood-frame beds with mattresses, lockable door, 1 or 2 room layouts for up to four or six campers. Porch with swing, electric lights, screened windows, equipped with flat screen TV, cable and wireless internet, mini refrigerator, fire ring outside your door and picnic table. Use KOA clean restrooms/showers. All you need is a sleeping bag or other bedding, towels, cooking/eating utensils. Pets are permitted. 100 sites with full or partial hookups, picnic table, fire ring, clean showers and restrooms, playground, swimming pool, hiking, 5 acre fishing lake (catch ‘n release), paddleboats, horseback riding, hayrides, miniature golf, game room, laundry, grocery store/gift shop. Country cottages sleep six and have one Queen bed and bunks to sleep four guests. There is a stove, refrigerator, sink, running hot and cold water, bathroom with toilet facilities, sink, shower and vanity, gas heat and air-conditioning. Equipped with flat screen TV, cable and wireless internet. The cottage is completely furnished with all bed linens and towels. You must bring personal items and beach towels are suggested for swimming season. There is a full kitchen with microwave, toaster and coffeepot. All cooking and eating utensils are furnished. Outside, there is a porch swing, picnic table and fire ring. *NO PETS ARE PERMITTED IN COUNTRY COTTAGES. 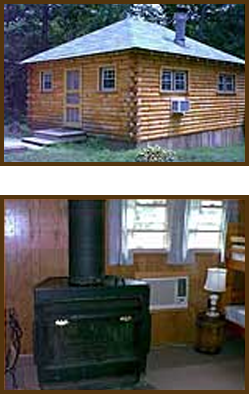 KOA Value Kard Rewards Discount NOT Applicable On Country Cottages. The Department of Agriculture prohibits moving of firewood due to the emerald ash borer. Firewood must be purchased from the KOA Store. KOA Value Kard Rewards discount is NOT applicable on Country Cottages. This versatile, camper-ready cottage is like your very own log vacation home complete with bathroom with sink, shower and toilet facilities, kitchenette, dining area with log table and chairs, gas fireplace, air-conditioning. Sleeps four. There is a futon which opens to a double bed and one set of bunk beds which sleep two. 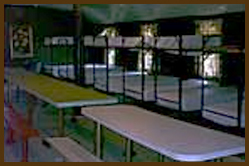 The kottage is completely furnished with all bed linens and towels. You must bring personal items and beach towels are suggested for swimming season. There is a full kitchen with microwave, equipped with flat screen TV, cable and wireless internet, toaster and coffeepot. All cooking and eating utensils are furnished. Outside, there is a porch swing, picnic table and fire ring. *PETS ARE PERMITTED IN THE DELUXE KOTTAGE. KOA VALUE KARD REWARDS DISCOUNT IS Applicable. The Department of Agriculture prohibits moving of firewood due to the emerald ash borer. Firewood must be purchased from the KOA Store. -Ideal for groups and organizations! *Please bring bedding, towels and personal items. KOA Value Kard Rewards discount is not applicable. Open Memorial Day Weekend through Labor Day Weekend from 10:00 a.m. to 9:00 p.m. daily. 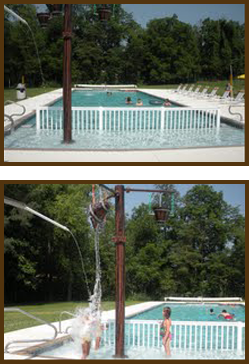 Large 24′ x 82′ pool. No lifeguard supervision. All children under 12 years of age MUST be accompanied by an adult 18 years or older. 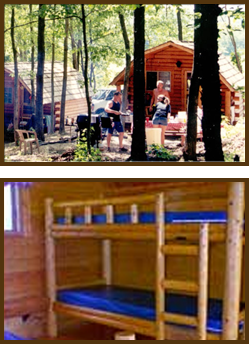 with the rental of your campsite, kabin or kottage rental. 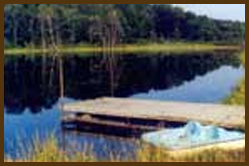 5 acre lake, no charge with the rental of your campsite, kabin or kottage rental. 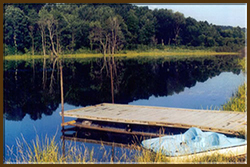 All children under 12 years of age MUST be accompanied by an adult 18 years or older while at the lake. 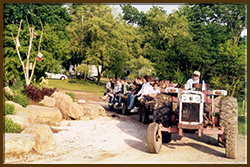 We will gladly arrange a one-hour long hayride for your group any time. Private bonfires and food catering available.